I am back, shoulders sore from the two-hour commute with my faithful backpack once again mounted on me, in an airport. Airports are like little cities, a micro-civilisation sprawling out across terminals. From where I sit in the departure lounge at Heathrow airport I can see people eating, shopping, talking, working, and one young woman opposite me is sleeping. All of us are temporary residents in the most multi-cultural country in the world. Emotions are also high at airports, which I like. You get to see under the mask. People are either so exhausted from early starts or six-hour layovers or their previous flight that they stop caring about how they come across and just are. Some are cranky, others near-manic, and others just blank and slack-jawed, thoroughly worn down by travel. And then you get people at the other end of the emotional spectrum: the excitement. Adults freed from the shackles of work and undeflatable by the prospect of a holiday. Children running around, still excited by the novelty of an airport and the flight to come. Often these exuberant kids belong to the exhausted adults, too tired to tell their children to stop playing tag amongst the perfumes. I don’t think these polar extremes of energy levels are a coincidence. Luckily for me, I fall into the latter category: the excitement. And I totally won that tag game. No, I am the undeflated adult still revelling from my emancipation. And today I get to go to Austria. Vienna, to be exact. The fact that I get to write a sentence like “Today I get to go to Austria,” illustrates just how insanely lucky I am. Insanely lucky to have the wealth to afford the trip. Lucky that I have parents who educated me to get a good job to get said wealth. Lucky that I have a mind-blowingly generous friend who lives in Vienna, giving me both a reason to visit the city and a roof over my head. I’m feeling very lucky right now. The past week hasn’t been all sleep-ins and leaving a perfect indent of my body on the couch though. I made some moves towards gaining employment. While I wait on registration to come through (still) I can get work as a carer in the community, tending to the more fundamental aspects of my job rather than the technical. While this isn’t something I could do long-term, I don’t mind the idea of starting in London this way. It’ll give me time to explore London and get the lay of the districts around me. It’ll also give me the opportunity to learn how the UK community health, and their NHS, works. Information I’m presuming will be useful. It’s also, compared to care-managing a team of nurses, blessedly free from a lot of responsibility. The good thing about being at the bottom of the ladder is you can always pass your problems up. I met with my agency in King’s Cross and interviewed — I say interviewed, but like all aspects of getting work in the UK has been, it was really an exam. I filled out a ton of paperwork, provided all the paperwork I had already sent across electronically, and answered pages of drug calculations and short-answer scenario question. Good fun. At least if my registration never comes through I can try my luck in the West End. Dom and Nikki also began a twelve week work-out program that I optimistically agreed to participate in, blissfully ignoring the fact that they’re both much stronger than me. After a leg session, I struggled to walk for three days, and had to lower myself into chairs with my arms in case my legs gave way. It gave me a new appreciation for my mobility-challenged patients. I have only regained the use of my arms after an arm and ab session, and still wince if anyone touches my stomach. I guess I should be happy the exercises are working. 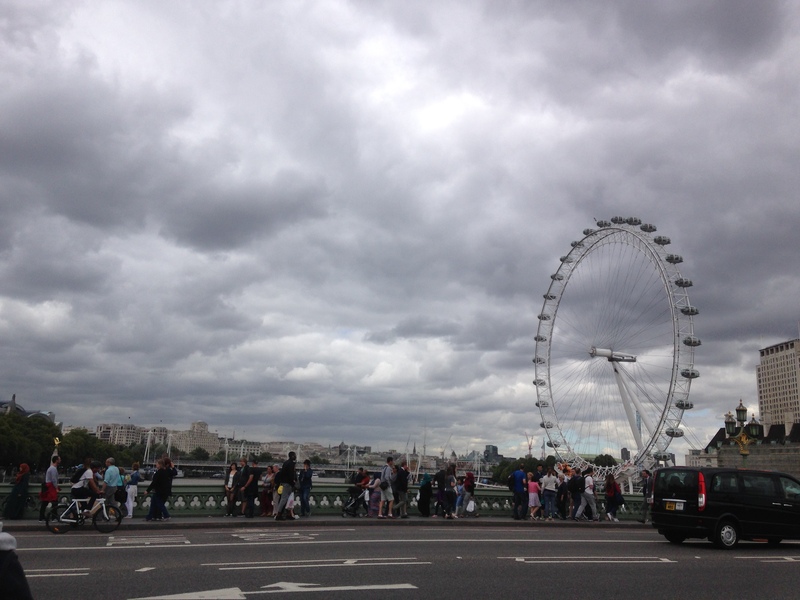 I am loving life in London, and it’s been exciting to start building a life in another country. Every small win becomes a huge victory because you’re doing it in another land, and that deserves a healthy pat on the back. The girl opposite me is waking now, and that’s my cue to wrap it up. I am sitting in the lounge room of my friend Alex’s house, a cat curled around my feet, in Vienna. And just like that I’m in another country. I realised today that the commute on the underground to get to Heathrow airport took the same amount of time as the flight to Vienna. It’s a weird world we live in. The hospitality I have received is staggering. Alex’s family have graciously taken me into their home, making every effort to ensure I’m comfortable. 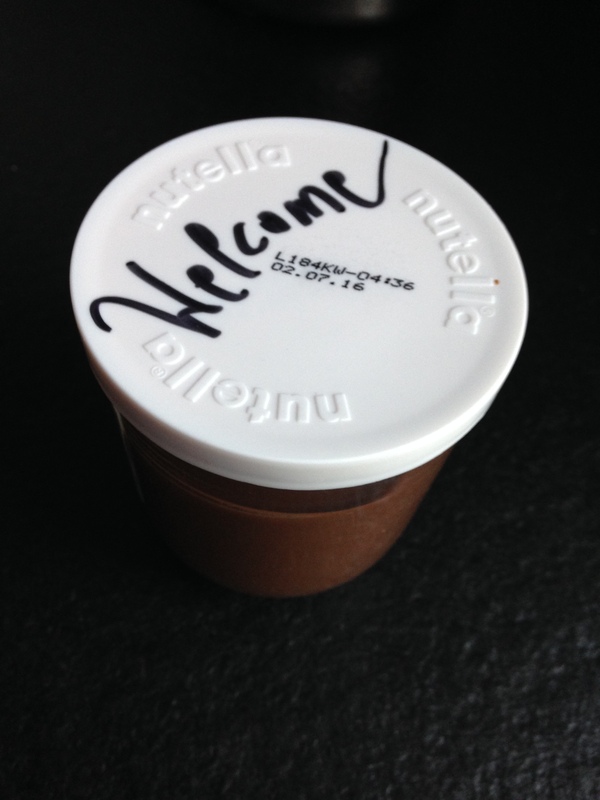 Alex’s mum, Monika, had even read my post from Italy, deduced that I have a soft spot for nutella, a bought a jar for my arrival — which she wrote a welcome message on! I can now say from experience that there is nothing more welcoming than a personalised jar of nutella. Nothing. I was collected from the airport (personal chauffeur) and driven to Alex’s home, given a tour of said home, shown my own room, towel set — even my own shelf in the bathroom cupboard —walked to the local pond (Alex calls it a pond, but I think that’s being humble. In Australia we’d call it a lake — it was far from the tiny waterhole I had been picturing). 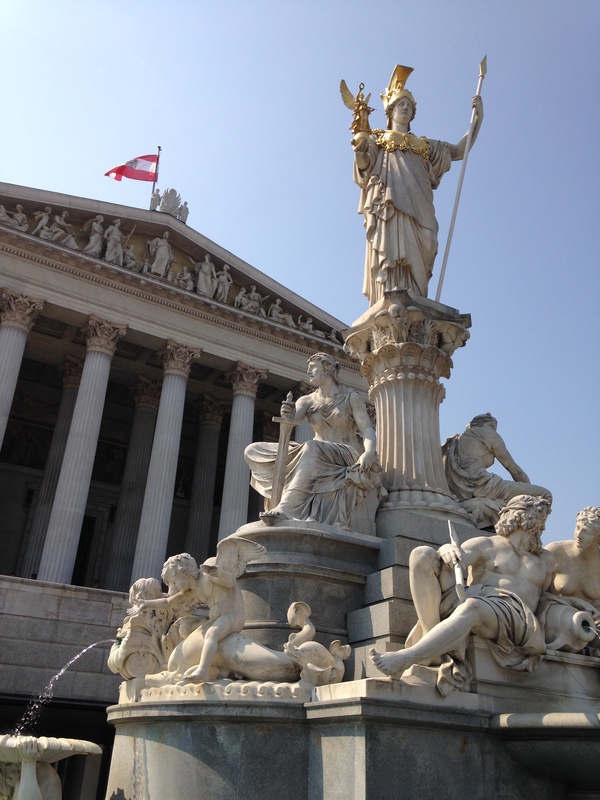 From there, driven into town and a stop for some truly delicious ice-cream, then on to the River Danube to soak our feet (it’s averaging around thirty-six degrees in Vienna. And I’d just acclimatised to London’s twenty-two degrees). Then sitting in a restaurant by the river to enjoy a Radler (think shady) and brocollinockerl (think small pieces of dough cooked in a cream sauce with ham and broccoli — very nice). And this was only the first day! Already, Alex has detailed the list of activities she has planned, and I swear my eyes grew larger with each one — I couldn’t be more excited. Alex told me that the Viennese (that’s the proper term, I checked) have a reputation for being cranky and impatient. Luckily for me, I have found only the opposite in my foster home — a sign of how unique these people are. I feel honoured and humbled by how readily I was accepted, and the effort Alex and her family have gone to to welcome me. When I offered to help around the house, mop the floors, feed the cats (anything!) I was politely rebuffed and told just to relax and enjoy myself. I am definitely enjoying myself, although it does feel weird to do nothing. Alex and her parents all leave for work in the morning and I can’t help but feel like I should be shrugging on a uniform too and earning my keep. I don’t think I’ve learned the knack of stopping, of switching off self-expectations and appreciating the here and now. After Austria, I have two weeks on a Greek island with nothing more pressing to do than eat, sleep, drink, read, write, and swim, so I’m hoping to perfect the art form then. It seems the appropriate place to do so. I am back, relaxing while the household works, in Alex’s lounge room, her cat again sitting by my feet. I think he does this to get a mention in the journal. It has been a brilliant couple of days since I last wrote. On Tuesday, chased by my own conscience from laying about while others worked, I headed out solo into Vienna — I only went a kilometre down the road, but I’m still marking this as a victory. I even greeted someone from the neighbourhood. Luckily for me, “Hello” in German is “Hallo,” so I mastered this one a while ago. I headed to the “pond” and jogged a few laps, which seemed like a good idea in the cool of the house, but quickly became a sweaty mess once I exposed myself to the sun. 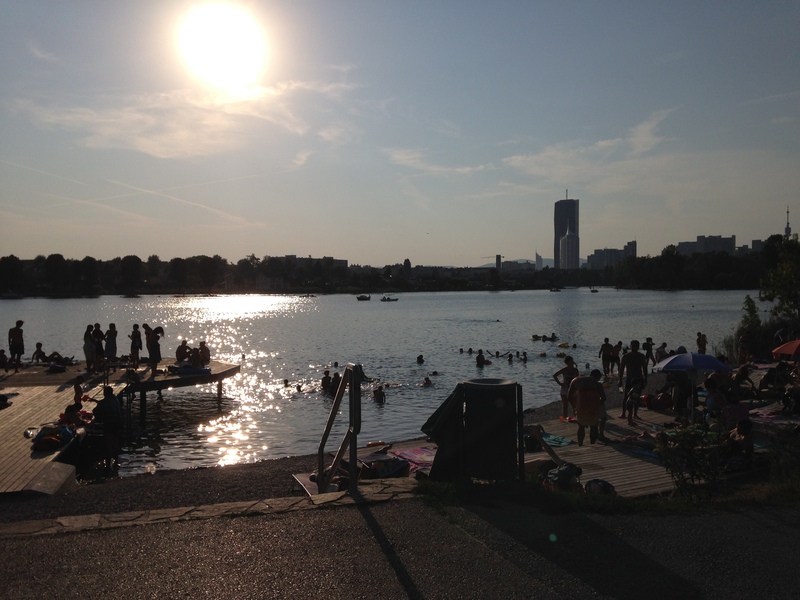 Of course, I was jogging around a huge body of water, so cooling off wasn’t too hard. After my swim I headed home and met Alex for lunch, then we headed to a carnival. When I was in Year Twelve, my English teacher, Mr Savage, made us study a movie starring Orson Wells based on a Graeme Greene story called The Third Man. At the time, I was a bit resentful that my class had to study a black and white film while all the other classes studied Gattaca. 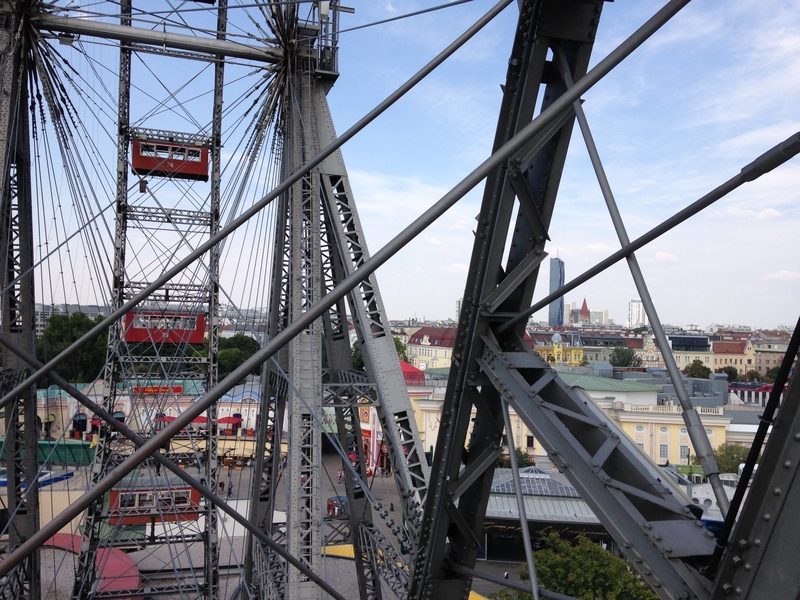 But the movie was actually good, and more importantly to this anecdote, featured a huge ferris wheel from Vienna. Two days ago, I rode that ferris wheel. Mr Savage, if you could see me now. The ferris wheel has been operating since 1897, and once Alex assured me they regularly serviced it, we headed up. The view was amazing, with Vienna laid out around us. The next treat was dinner at Schweizerhaus, where we caught up with Anna and her boyfriend. I met both Anna and Alex on a tour through Vietnam and Cambodia, and it was very cool to be sitting with these two lovely people again, in a foreign country (for me, anyway), chatting and eating. Which brings me to the main event — the steltz. Steltz is a huge piece of cooked pork, surrounded in stripes of juicy crackling, and it may have been the best thing I’ve ever put into my mouth. I would have put a photo up but we devoured it so fast there was no time for happy snaps. 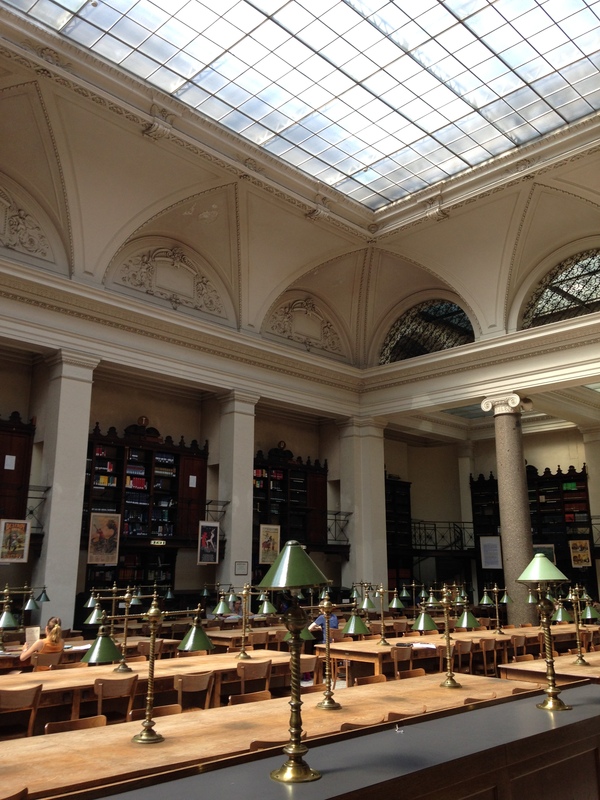 Yesterday, Alex took me through Vienna’s city proper, and to her university and its beautiful and ancient reading room. We were both convinced it was very Harry-Potter-like, but sadly I saw no evidence of magic. But there were books, very old books, and the smell of them hung in the air, and that was a kind of magic of its own. We also saw the parliament building, which outshone any building I’ve ever seen in Australia. And, in a weird twist of fate that makes you believe everything in the universe is connected, I went and saw Alex’s and her dad’s company — the same company my dad works for. We were all very excited by this, and Alex and Dad even had a quick chat over the companies chat room. Small world. In the evening I met a couple of Alex’s friends who were both incredibly friendly and welcoming. We drove up to a hilltop on the edge of the city, set up a picnic and enjoyed the view. From our vantage all of Vienna lay out like a blanket below us. It was beautiful. We had decided on a picnic as it was reported to be a good night to see shooting stars. As the sun set, we laid back and watched the sky, armed with our wishes for when we spotted one. Collectively, we saw around ten shooting stars, although I’m skeptical on a few that may have been planes. Or UFOs. We made our wishes anyway. It was a beautiful night in Vienna, and in some ways I’m shocked that this is only the third day. So much has happened and I feel so comfortable in this place. Thankfully, there’s plenty more to come. Sounds amazing Jon, and what a beautiful welcome from Anna and her family – you are lucky! !